ChimpExpress. 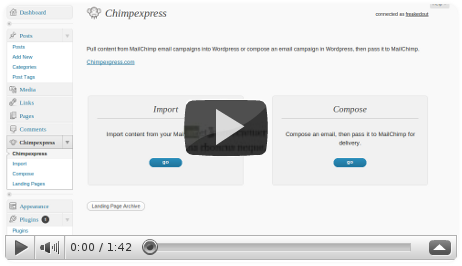 Create Mailchimp Campaigns Faster! Sign up for the ChimpExpress newsletter - Get notified about new features, fixes and new releases. Import your newsletter campaigns to Wordpress. Afterwards edit them with the wysiwyg for perfect results. Use existing content from your Wordpress site to populate your latest newsletter. Then send the draft to MailChimp to finalize your campaign. Connecting ChimpExpress to your MailChimp account is a snap. All you need is your MailChimp API key.